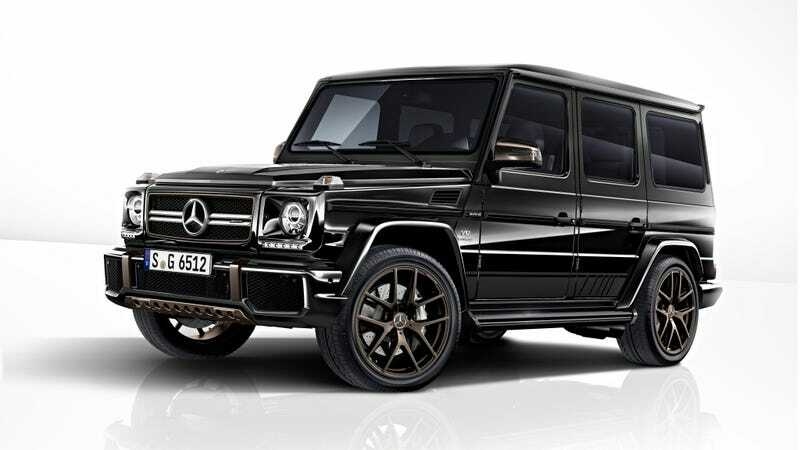 The Mercedes-AMG G65 is an amazing 5,600 pound anachronism of an SUV, with a 6.0-liter V12 putting out what Mercedes says is 630 horsepower. And while the G-Class, as introduced in 1979, will live on, Mercedes-AMG says the G65 will not. On Thursday, the company announced it would be releasing 65 “Final Edition” G65s to mark the occasion. Like every other AMG G, the Final Edition ’65s will undoubtedly make a lot of noise and have the power to make passengers sick but even with a claimed 0 to 62 mph time of 5.2 seconds, the machine is more about opulence for its own sake than speed. This special model also has a high-quality interior design: the scope of equipment includes the designo Exclusive package in designo black nappa leather with seat side bolsters in a carbon-fibre look and topstitching in light brown. Carbon-fibre trim elements with decorative stitching in bronze, the milled Edition lettering in the grab handle plus floor mats with leather edging in light brown and topstitching in black round off the look.